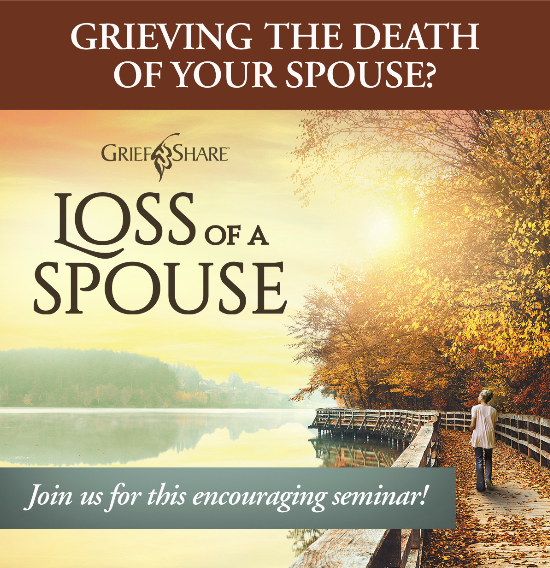 This seminar features practical suggestions and reassurance through video interviews with counselors, grief experts, and others who have experienced the unique pain of losing a spouse. Topics discussed include what to expect in the weeks and months after a spouse’s loss, what to do with surprising emotions, how to handle changing relationships, how to handle the loneliness, what to do with your spouse’s belongings, and how to find the strength to go on. Our next Loss of Spouse seminar will be held June 6 at 6:30 p.m. These sessions are two hours in length and held at Shady Grove UMC, Room G111. Everyone who attends receives a booklet with over 30 short readings on how to live with grief and eventually rebuild your life. Our Fall 2019 GriefShare support group session will begin Sunday, August 18 and will run through November 17, 2019. We meet Sundays at 2 p.m. in Room G111. GriefShare is a special weekly program designed for those who are suffering the deep loss caused by the death of a loved one (parent, child, sibling, spouse, or friend). This program provides the compassion of others who understand what you are experiencing. These sessions are open to anyone who has experienced the death of a loved one (recent or not so recent). The sessions provide encouragement and help in grieving the death of your loved one. This is an opportunity to be around people who understand what you are feeling; to learn valuable information on facing life situations, and to gain renewed hope for the future. If you or someone you know could benefit, please join us. We also offer special two hour - one time sessions "Surviving the Loss of Your Spouse" two to three times throughout the year and a two hour "Surviving the Holidays" session in November. Please check back to this page or email griefsupport@shadygroveumc.org for specific dates. For more information or to sign-up, email griefsupport@shadygroveumc.org or call the church office at 804-746-9073. Our church building is located at 8209 Shady Grove Rd., Mechanicsville, VA 23111.